Well, here we go. I was telling students about the writing challenge I would take in March. 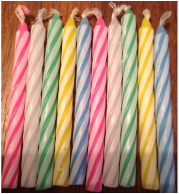 I would write every for March as part of Two Writing Teachers' Slice of Life Challenge. A few students thought it would be fun to try and before I knew it we had a classroom event. 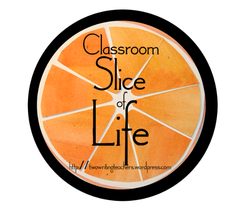 For March, our class will be participating in the Slice of Life Challenge. Participation is OPTIONAL. Participating students have decided they will post from their blog, in their writer's notebooks, or in Writer's Workshop (one new page of a story minimum). Our class status updates will be shared from our blog page (see top). To help each other, participants may gather in our classroom for lunch on Tuesdays. We'll share writing and talk about how it going. Since the event begins on a Saturday, students have developed a plan for writing from home for the first two days. Some are writing on their blogs (which I will check and approve once in the afternoon and again in the evening). Students who have written at least 25 of 31 days will be considered to have fulfilled the challenge. If your son/daughter chose not to participate, that is his/her choice. It's too hard of a challenge to not have your heart in it. However, if they decide they want to join, they are always welcome. Our class is blogging on Kidblog. Students often blog during the school day to share about the books they are reading, important things that have happened to them, new learning, or other topics of interest. Students may also access the blogs from home. This video shares the basic steps to access Kidblog and post from home. They may also read posts and comment from home. Please remember, visitors may comment as well. I suggest commenting using names like "Sara's Mom". I moderate all comments so they will not appear immediately. Beginning in September our class joined the Global Read Aloud discussing picture books by Eric Carle (#gra13ec). This event connected us with classrooms around the world in one common conversation. We interacted with other classrooms through our @snowleopards1M account and joined the common conversation. 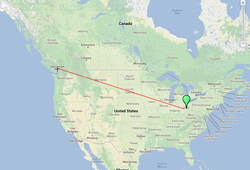 We were especially excited to end our participation with a Skype conversation with our friends from Mrs. Sekhon's class in Vancouver, BC, Canada. We were surprised to learn they were three hours behind us. We had already had lunch and were nearing the end of our day when we chatted. They hadn't had lunch yet and were getting ready to go on a field trip. We asked each other questions during our conversation. We talked about our favorite Eric Carle books as well as what we had noticed about his work. We were surprised to find we had some of the same favorite books! We look forward to learning with them again soon! Our class is participating in the Global Read Aloud with many other classrooms around the world. Each week a new book is featured. We are reading six books by Eric Carle during this time and connecting with other classrooms. This week we talked about friendship after reading Eric Carle's book: Will You Be My Friend?. Stop by our VoiceThread to tell us how you can be a good friend. Linda Stanek came to visit our school. She is the author of many books including: Beco's First Year and The Jack O'Lantern Tree (in eBook for only 2.99). Ms. Stanek talked with us about the books she has written, the research she has done, and her new interest in illustrating. We were able to hear her in a whole group session and then she came to our room to answer our question. Today was the first day of the Global Read Aloud. Our class is participating with classes around the world. We will be reading books by Eric Carle. You can follow the conversation on Twitter at #gra13 or #gra1st. Today we read The Very Hungry Caterpillar. After enjoying the book we talked about what the author wanted us to know. 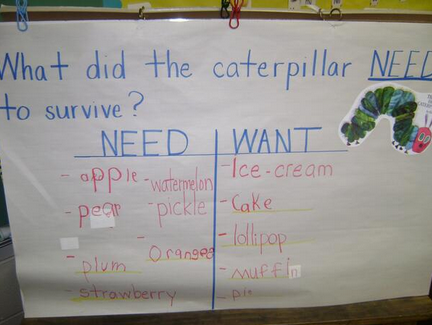 Grace said, "Eric Carle wanted us to know about the caterpillar. He got hungry. Then he ate and ate and ate. Then he turned into a BEAUTIFUL butterfly." I shared a few comments from other classrooms with the students. When we saw the chart Ms. Jeckavitch's class made together after reading the book we had quite a talk about food. Later in the day, we decided to join the end of the month Chalk-a-Bration hosted at Teaching Young Writers. 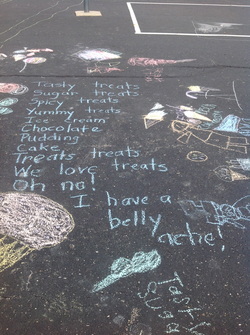 We thought again about our conversation and decided to write a poem about the tasty treats we love. Like caterpillar we eat some healthy foods, but we also find a tasty treat yummy every now and then. You can see the students' blog post about our Chalk-a-Bration on our blog. Early in the year our class started recording the books we read on a class Shelfari shelf. The collection of books we've read together continues to grow. Earlier this week, one of the students in our class started a Shelfari account with his family. 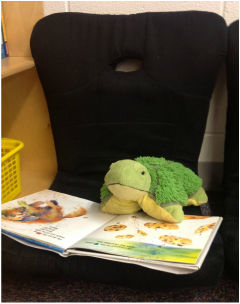 We enjoyed seeing the books he was reading and adding new titles to our to-be-read list. This evening I came home to three more emails from families who have started shelves for the books their children are reading. Yay!! These shelves will be the perfect way to share our reading lives. On September 16th our class participated with classrooms and people from around the world in International Dot Day (#dotday). We read The Dot by Peter Reynolds. In this story, Vashti learns that if you just try something you can do great things. All Vashti's practice pays off and she gets better and better at making dots. Her creativity shines in this story and reminds us to just give new learning a try. Our class created dots using markers. Each student creatively designed their own dot. As we began to put them on paper, it was suggested that perhaps we should arrange our creations in the shape of a dot too. Our poster hangs in our room to remind us to "just try it." Students often need to take a restroom break across different parts of our day. For this reason, instead of taking a whole class restroom break in which everyone is to take a restroom break at the same time, students have a restroom clip and may choose the time of day to go to the restroom. Each student has a restroom clip he/she gives to me when a restroom break is needed. Upon return from the restroom, the student returns to me for the restroom clip. This helps me to know who is out of the classroom at any time. The restroom clip is then dropped into the container. At lunch the restroom clips are returned to the top of the container. This allows each student a time to go to the restroom in the morning and the afternoon as needed. In our classroom we do talk about times that are better for restroom breaks (first thing in the morning as students enter, during independent work times, in transitions, etc.). I encourage students to try to wait if we are in the middle of a class lesson to minimize interruptions for other learners. 1. Books: If your child brought a book from home it will be returned tomorrow at the end of the day. If your child did not bring a book this evening, s/he is welcome to bring one tomorrow. However, having a book tomorrow is not necessary. We have plenty of books in the classroom. 2. Family Photos: Thanks to everyone who brought a photo, or had a family photo taken, this evening. Please let me know if your photo cannot be laminated by emailing cathy_mere@hboe.org. 3. Communication: Most information will be kept on our website. I will also use email frequently to share important information. Please contact me if you do not have internet access or have concerns about this. 4. Specials: Our special schedule can be found on our class calendar. Just click the link in the above bar. Many students are excited to have lunch at school tomorrow. If your child is packing, lunches will be placed in our lunch basket and carried to the cafeteria. If your child is buying, s/he will go through the lunch line and then key in her/his student identification number. We will practice a little tomorrow, but student identification numbers can be found on home access. A practice sheet was enclosed in the school information you received this evening. I will join them at lunch to help them get through the lunch line. A lunch menu is available online. If you have questions, please let me know. This year students have many choices for lunch. 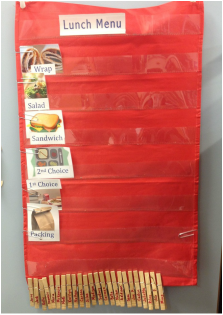 Students may choose from two different meals each day, a sandwich selection, soy butter and jelly wrap or salad. Talking with your child about the choice he/she will make when buying can help your child get checked in and off to the right start each day. Talking with your child about whether s/he will choose first or second choice, or other selections, before they arrive at school is very helpful in these beginning days.